Steam broccoli on stove-top for approx 13-15 minutes. Avoid overcooking! While steaming broccoli, slice the shallots, and prepare the beef. Slice the filet against the grain, very thinly, to create delicate strips about 1/4 inch thick. Lay them flat on a cutting board, cover with plastic wrap, and gently flatten them with a meat tenderizer. (Be very careful when flattening the meat; I literally only pound each section of each piece one time. This ensures a wonderfully tender experience in every bite.) Season the beef slices with salt and pepper. Sauté the beef in oil in a large sauce pan for about 45 seconds per side. Then transfer to a plate while you continue to cook the rest of the beef in batches. Next add in shallots, sauté for 2-3 minutes, then add ginger for another minute. Stir in red curry paste and continue to cook for about one more minute. Add in fish sauce, brown sugar, 1/4 teaspoon salt and pepper, and coconut milk, and let it simmer until it thickens up - about 4-5 minutes. 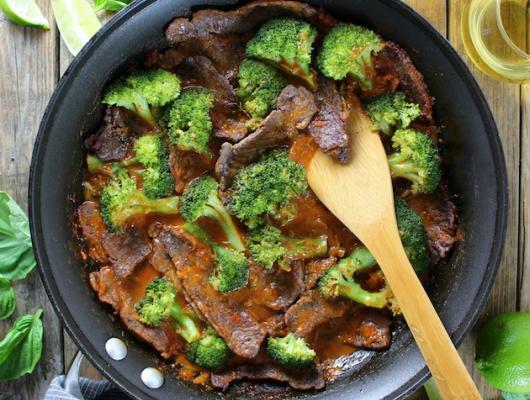 Add your beef and broccoli back into the pan to heat up and serve! Recipe Notes: If sauce thickens too much add a tablespoon or two of water to thin it out. 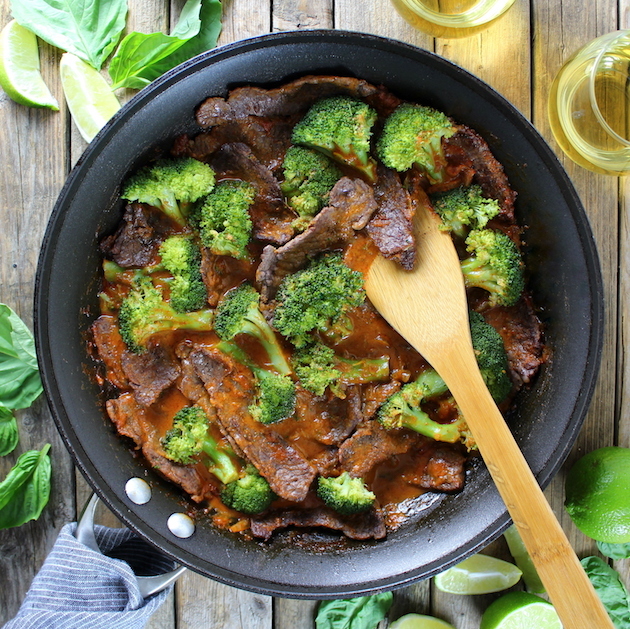 Thai Beef with Broccoli - an easy flavorful weeknight meal! With coconut milk, red curry paste, shallots, brown sugar, fish sauce, broccoli and beef.